Groups Acting Outside Of The Candidates’ Campaigns Funded About 84% Of The Negative Ads That Aired Last Fall In Races For Governor, State House And State Senate. LANSING (JAN. 9, 2019) — A child walks out of an empty house toward a moving truck. She’s carrying a stuffed animal while a narrator talks about job losses and “disastrous” tax hikes. Brown water pours out of a faucet and into a bucket. Another narrator talks about the Flint water crisis and then-Attorney General Bill Schuette, Whitmer’s Republican opponent for governor. “Schuette only spoke after the scandal broke and threatened his political career,” the narrator alleges. These are examples of some of the many attack ads from Michigan’s 2018 election. 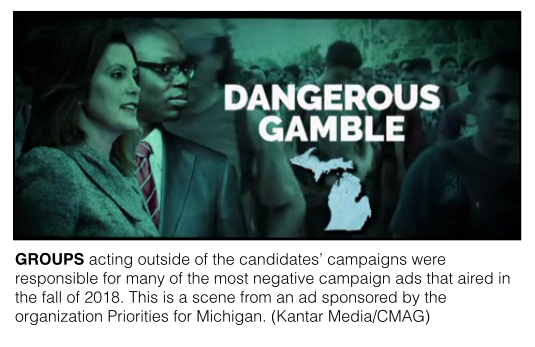 Those negative ads flooded Michigan TV screens last fall, and the wide majority of them were sponsored by groups acting outside of the candidates’ campaigns, according to a new analysis examining more than individual 60,000 broadcast ad spots. Using ad-tracking data from the firm Kantar Media/CMAG, the Michigan Campaign Finance Network analyzed broadcast TV ads that aired in the general election races for Michigan governor, state Senate and state House. The analyzed ads didn’t include TV ads that appeared on cable or in the primary election. The analysis tracked 20,876 broadcast ad spots that were entirely negative in their messages. Candidate campaigns and their caucuses sponsored only 16 percent of the ads that were entirely negative, according to the analysis. The remaining 84 percent of negative ads spots — 17,564 spots — were sponsored by groups operating outside of the candidates’ campaigns. The story was completely different when it came to the positive ads. The analysis tracked 24,410 ad spots that were entirely positive in their messages. About 72 percent of the positive ad spots — 17,609 spots — were sponsored by the candidates and their caucuses. Only about 28 percent of those positive ad spots were sponsored by the outside groups. The numbers show that outside groups, which at least appear to be separate entities from the candidates’ campaigns, often use their status to fund attacks. Such attacks could pose more risk to candidates if they came directly from the candidates because of potential backlash against the negative tone. Also, the donors to outside groups can be much more difficult to track than donors to candidates, meaning that discovering the donors who bankrolled some of the most negative ads that ran last fall is difficult and in many cases, impossible. The nonprofit organization Americans for Prosperity, spent an estimated $738,750 on broadcast TV ads against Democratic gubernatorial candidate Gretchen Whitmer in the race for governor during the general election campaign (the group spent more during the primary). The ads the group ran were negative, according to the tracking, and the group didn’t have to disclose the original sources of the money. An example of the disclosures the group did have to make is here. On the other side of the aisle, the analysis tracked an estimated $8.75 million in broadcast ads from the political organization, A Stronger Michigan, which is connected to the Democratic Governors Association. The organization spent an estimated $3.73 million on broadcast ads that were negative against Republican Bill Schuette. As a 527 political organization, A Stronger Michigan reported its donors to the Internal Revenue Service. However, its top two donors were groups that raised their money from elsewhere, according to the disclosures: the Democratic Governors Association gave $2.50 million; and Progressive Advocacy Trust gave $1.87 million. In Michigan Senate races, a handful of nonprofit organizations funded negative attack ads without disclosing their donors. As an example, an Ohio-based group called A Public Voice aired an estimated $146,000 in negative broadcast TV ads against two Democratic candidates for the Michigan Senate. Of the 1,417 negative broadcast ads the analysis tracked in state Senate races, 72 percent came from outside groups. The wide majority of those groups didn’t have to disclose any information about their donors because they are nonprofit organizations and their ads didn’t expressly tell viewers how to vote. Of the 60,370 individual ad spots tracked for the analysis, 24,410 spots — or about 40 percent — were completely positive while 15,084 spots — about 25 percent — featured both negative and positive statements (usually negative statements about one candidate and positive statements about the candidate’s opponent). The rest of the spots, 20,876 — about 35 percent — were completely negative. Some of the spots that featured both positive and negative statements could also be quite negative in tone. For instance, the group Priorities for Michigan aired an estimated $108,000 in broadcast ads in the days before the election attacking Whitmer and her running mate, Garlin Gilchrist. During the primary election, a group by the same name ran digital ads criticizing Whitmer for not supporting single-payer health care, according to The Detroit News. Because the ads didn’t expressly tell people how to vote, Priorities for Michigan didn’t have to file campaign finance disclosures under state law.